Monopoly Live is now available to play at live casino’s. The beloved board game that is known globally is exclusively available from Evolution Gaming. Monopoly Live is an online game that is inspired by the world-renowned board game that is popular with many people. Just like the original board game, Monopoly Live brings the adventure and thrill that the game entails to a wheel game that has a few components added to it. Evolution Gaming brings live action games to enhance a casino players experience. In addition, to allowing the players to win multiple times. How Monopoly Live works, is a host spins a giant wheel and the players guess where the wheel is going to stop. Players have the opportunity to place bets on what number the wheel is going to stop at. The wheel has ‘Chance’ segments for cash wins that can come instantly. Also, there are ‘2 ROLLS’ and ‘4 ROLLS’ segments. The segments activate a virtual reality with a 3D Bonus game that is about Mr. Monopoly and his financial adventures. 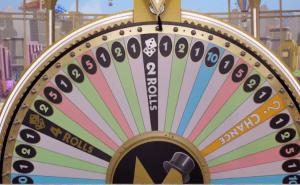 The numbers that the players bet on the wheel are 1-10, ‘2 ROLLS’ or ‘4 ROLLS’. When a player bets on the right number, they win a payout. When the wheel stops at ‘CHANCE’, the players receive a Monopoly chance card. The card can have a cash prize or a multiplier bonus. Players who have a chance card can continue to place bets. The wheel then has another spin from the host. The multiplier can multiply their winnings for the next spin to come. There is a bonus round on Monopoly Live. Players that are qualified can then play the 3D Bonus Round. The players then accompany Mr. Monopoly into a virtual reality. The players take virtual steps around the 3D board game to have a chance to win prizes and multipliers. A pair of dice determines where and how many steps the players can take. To qualify for a chance to play the bonus game, the players need to place their bets on ‘2 ROLLS’ and ‘4 ROLLS’ in the game’s money wheel. Monopoly Live offers all of the fun details that the original board game has such as Chance and Community Chest, Go, the hotels and houses, also, Super Tax and the Jail. Monopoly Live is a fun and creative game to play at a live casino. Many people are familiar with the original board game, now casino players have the chance to play a classic and loved game with an opportunity to win big. Riga is hosting the latest project from Playtech that is a live casino! History of Roulette – different stories!